Experience the best of Patagonia on this 12 day adventure of a lifetime. From the Lake District around Bariloche across one of the lakes to Chile's Torres del Paine National Park back to the Glaciers of El Calafate, this trip highlights the many wonders of Patagonia, from Lakes and Glaciers to Peaks and ridges, you will be immersed in the immense beauty of the southern parts of South America. 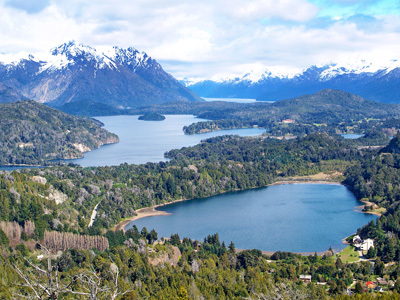 San Carlos de Bariloche, the gateway to the Argentine Patagonia, is perched on the tranquil shore of Lake Nahuel Huapi. The incredible natural beauty of the area is available all year round for a rejuvenating retreat. In addition to the region's famous outdoor activities, ranging from mountain biking and kayaking, to snow boarding and hiking, the town of Bariloche itself, features a charming Swiss Alps feel. Enjoy a relaxing morning to sleep in and rest, before you are picked up at the hotel at 10:30 am. With your private guide, you will drive to Bahia Lopez, located just under an hour away. Here, you will get to enjoy a leisurely walk that will lead you deep into the woodlands. At the end of your walk, you will be rewarded with the views from the natural balconies at the Brazo Tristeza of Nahuel Huapi Lake. The walk itself will offer breathtaking views over the nearby mountains and ravishing lake. You will access another balcony as well, after a short ascent, where you can admire the beauty of the Cerro Tronador. During the 40 minutes trek journey in total, there will be a mild altitude gain and about a 20 minute ascent. Today you will check out from your hotel in Bariloche and board a boat to cross the lake towards Chile. This is a stunning way to explore the majestic lake district. On arrival on the Chilean side of the lake, you will be transferred to your accommodations in Puerto Varas to check in and enjoy the remainder of the day at leisure before dinner this evening. It's always the most beautiful natural landscapes, like New Zealand or South Africa, that host the most adventurous outdoor sports, and Puerto Varas is no different. A great center for discovering the surrounding Lakes District, Puerto Varas has been booming in recent years, and it's not coming from the two volcanoes in view of the city. Tourism has transformed the city, but it has retained its small town charm. 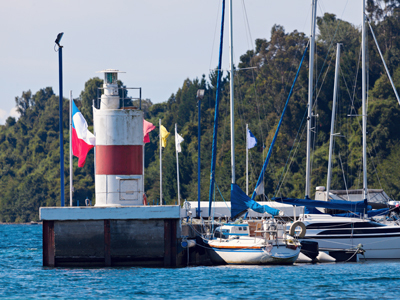 You will have the whole day to enjoy Puerto Varas and the incredible all-inclusive excursions provided by AWA. After breakfast, a private transfer will drive you to Puerto Montt airport where you will catch you domestic flight to Punta Arenas. Upon arrival to Punta Arenas a shared Patagonia Camp transfer will take you to your hotel. 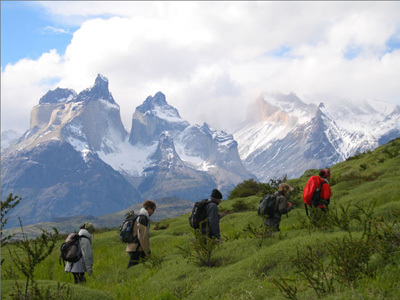 Your fully inclusive stay at Patagonia Camp includes daily guided excursions with an English-speaking expert in small groups with other guests. With endless options to choose from, your days at the Camp will be filled with fun and adventure, no matter what your interests are. You may like to head out on one of the many treks or hikes of varying difficulty. Explore the landscapes and admire the scenery of the Base of the Towers, the Ferrier Viewpoint, Valle del Frances, or along the Fauna Trail, just to name a few! Marvel at the calming waters of various lakes and lagoons, embark on kayaking excursions, or even fish on the shores of Toro Lake. Hike to majestic waterfalls, or continue trekking through the mountains. Now is your chance, so embrace this opportunity to discover the wild of Chile! After an early breakfast, a shared transfer provided by Patagonia Camp will drive you to Calafate. On arrival back in Argentina, you will check into your El Calafate accommodations and enjoy the remainder of the day at leisure. Today, you will embark on an unforgettable visit to the Perito Moreno Glacier! This is the world's most accessible glacier, and this excursion offers you the chance to truly soak in its natural beauty and sheer size. The scenery at the glacier is simply spectacular. To begin this journey you will be picked up very early this morning by a local guide, who will take you to the National Park Los Glaciares. Standing in front of the Perito Moreno Glacier is moving and exhilarating. It makes you feel as though you could stay in that exact position for hours and hours, contemplating the huge vertical wall of ice towering before your eyes. However, you are in luck, because today you are going to have the opportunity for much more than just looking from a far! Today, you will actually come face to face with the glacier, as you head out trekking over the multi colored ice, on your mini trekking group tour. So, gear up with your ice trekking equipment and get ready for the experience of a lifetime! When your guided trek is over, you will be left with enough time to walk on the trails, 500 m in front of the great ice wall of the Perito Moreno Glacier. Just to give you an idea of the size, the glacier measures in at 60 m tall, by 5 km wide. Believe it or not, it's total height is actually 200 m, however 140 m of it are submerged underwater. After plenty of time to explore, you will be returned to your hotel later in the day. 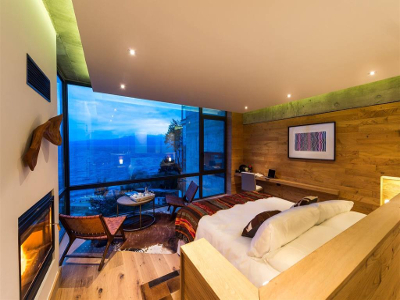 CasaSur Bellini Hotel is a brilliant boutique property that pays tribute to the history and culture of Argentina, while presenting sleek and modern decor. This luxury hotel offers well-appointed accommodations, complete with flat-screen televisions, kitchenettes and private balconies. Enjoy a delicious meal at Bengal, a fine-dining restaurant that features dishes with Mediterranean and Indian flare, or relax at the elegant spa, which includes the hotel's outdoor pool. With a quintessential location in the Palermo neighborhood, CasaSur Bellini presents the perfect starting point to explore world-class restaurants, lively bars, upscale shopping and unforgettable landmarks in Buenos Aires. Posada Los Juncos, a small family-run guesthouse, is one of our favorite properties. Located about 20km from Bariloche city center, and just 4km from Villa Llao Llao, Los Juncos provides a unique lake-front experience away from the masses. Rooms are charmingly decorated and comfortable, and the real highlight is the incredible food and wine. Your hosts here will make sure that when you leave Bariloche you'll wish you could stay for another week! Hotel AWA is a family and unique project. It is located in Llanquihue Lake´s basin, focused on providing an excellent service in lodging, cousine and spa. We offer an open proposal, through a customized service and without fixed programs. We adapt ourselves to our guests preferences, offering the possibility to include meals, excursions, spa treatments, as well as the chance to relax amongst the beautiful landscape the hotel’s facilities stand on. The location gives our guests privacy and comfort, with the lake´s shore at 20 metres from the facilities, private dock, 50-ares private field and nautic sports; you can find all this and more just 20 minutes by car from Puerto Varas downtown. We invite you to get to know and enjoy this new luxury experience in the Lake District. Patagonia Camp has been designed for every guest to experience and enjoy the wonderful nature of Patagonia with great comfort. From within the yurts, you will be able to hear the sound of wind or rain as you go to sleep, gaze at the stars from the warmth of your bed, and encounter one of the most beautiful landscapes in the world, right from your window or every time you step outside on the walkways. You will be immersed in a beautiful, aromatic native forest of coigües and notros, and enjoy watching and listening to the many bird species that live among the property. Patagonia Camp’s architectural design and construction is minimally invasive and harmoniously adapted to the local landscape. The entire complex is built on wooden piles, which support the terraces and yurts, as well as the common areas and interconnecting walkways. This building system helps preserve the native plants, shrubs and trees that have grown in the area for hundreds of years and the dozens of birds curiously observing the arrival of guests. This is just one of many authentic travel experiences offered by Global Basecamps. If you are interested in more unique destinations to Argentina with unprecedented planning and extraordinary service visit our main Patagonia tours page to browse other sample trips.